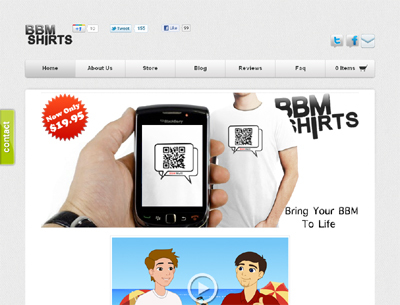 BBMShirts is all about celebrating Blackberry Messenger, a remarkable social network that helps make our daily lives more exciting. Quite frankly, we love BBM and we’re not afraid to show it. However we don’t just sell BBM barcode t-shirts, we sell a fun and exciting new way to interact socially with other BBM users. Case in point: Many of you have probably experienced a situation where you spotted someone cute with a Blackberry but just didn’t know how to approach them and break the ice. Well now you can, with the perfect Blackberry icebreaker. All you have to do is approach them wearing your very own BBMShirt complete with your fully scan-able BBM barcode and let your shirt do the talking. We are in no way affiliated with or claim to be an official product of Blackberry/RIM. Blackberry & Blackberry Messenger (BBM) are trademarks of RIM. All we do is sell custom made t-shirts to their users. We have no competition yet! !